Goal: To introduce student to students to a sculptural technique using papier-mâché. Objectives: Students will produce a bowl made of papier-mâché. 1. Smear a thin layer of Vaseline all over the inside of bowl. 2. Tear strips of newspaper and mix paste. Dip newspaper strips in paste, and apply to bowl, going over the rim to outside of bowl about ½ inch. 3. Vary the pattern of the papier-mâché to avoid any weakness, by alternating the direction of paper strips. Continue until entire bowl has a minimum of 3 to 5 layers of newspaper. This can be done in one sitting. For last layer, use paper towels instead of newspaper. 4. Allow to dry thoroughly; bowls should separate easily when completely dry, after using a utility knife to cut paper that overlapped the rim. 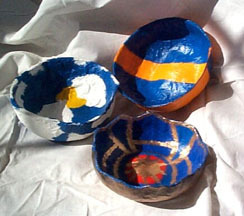 Remove remaining Vaseline from outside of papier-mâché bowl with damp, soapy cloth. If necessary, carefully pull away any loose strips from outside of bowl, and re-apply a couple of layers of newspaper and paper towels. Allow it to dry. 5. Decide whether to keep the rim of the bowl straight or to make it jagged, wavy, etc. Trim, if desired, with utility knife, without putting pressure on bowl. 6. Finish rim by applying papier-mâché (using paper towels) to rim. 7. When completely dry, prime bowl with one coat of gesso, and let dry. Then use acrylic paints to finish as desired. 8. Spray with 2 coats of varnish, allowing time to dry between coats. If desired, apply one coat of gloss interior wood varnish to seal and add sheen.